Memory is the base of identity, which is decisive for out individual and social behaviors. This means, the need to preserve or restore memory is even greater where ideological violence have distorted and substituted it with an artificial system of removals, disinformations, and propagandas: a “prosthesis of identity” (LINK). This is the case for the city and free port of Trieste, Austrian from 1382 to 1918, when it was occupied by Italy. 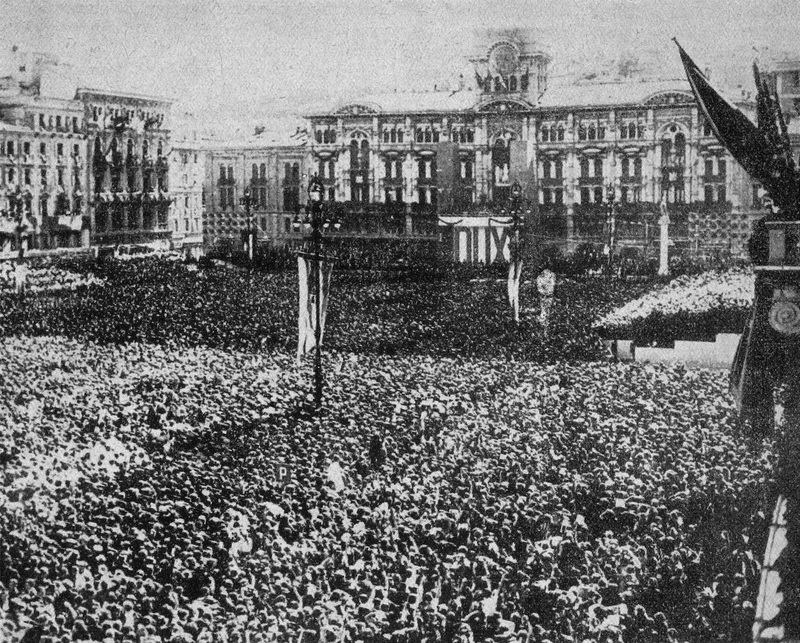 Since that tragic 1918, the historical memory of the plurinational people of Trieste was manipulated to be substituted with an Italian, nationalistic “prothesis of identity” made of racist, anti-Slav and then and later also anti-Semitic propagandas, accompanied by the demolition of ancient buildings in order to substitute them with monuments and symbols of the new regime. In the historical center of the city of Trieste, among the buildings of the piazza della Borsa (Stock exchange square) built back in the 18th and 19th Century, the style of the Wiener Sezession stands out with the floral and geometric decorations of the “Green House” (Casa Verde), or Casa Bartoli, designed by architect Max Fabiani and inaugurated in 1906, two years after his famous Narodni dom (LINK) of Slovenes, of Croats, and of Czechs, with valuable stained-glass by Kolo Moser. In the Austrian Trieste of that time, behind the original, elegant profiles of the buildings up to the Corso, the medieval quarter and its market, called Riborgo (Freiburg) was still beating the cultural and religious heart of Jewish Trieste, with its Schools and a Synagogue built in the 18th Century, where both Ashkenazi and Sephardic rites were celebrated. 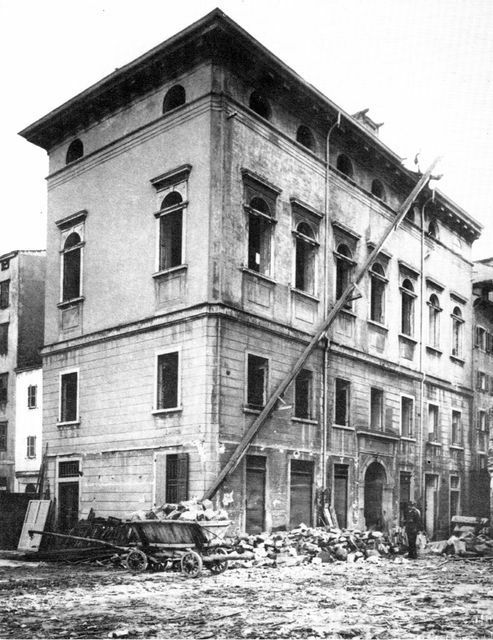 But in 1920 the Narodni dom was set on fire and destroyed by Italian nationalists, and between 1928 and 1937 the Fascist regime demolished the historical building between the Casa Verde and the Riborgo, including those of the Jewish community that were behind them (LINK), and substituted them with a massive, graceless building in the style of the regime, which did also host a big “Casa del Fascio”. It was the new House of the local Fascist party, allied to the Nazis and already busy preparing the proscription lists for the infamous Italian racial laws that, in 1938, Mussolini decided to proclaim right from Trieste, from a huge balcony mounted in the nearby piazza Grande renamed to “dell’Unità” (Italian unity) in front of a huge crowd of screaming fascists brought there from all around Italy, and silent, astonished citizens (LINK). 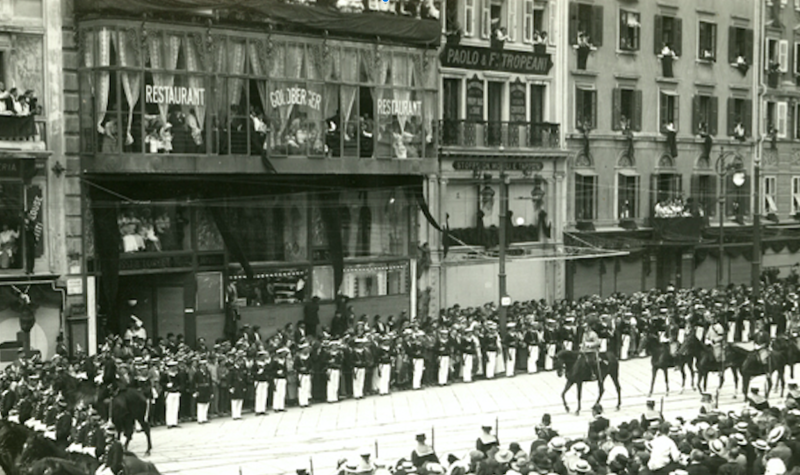 The racial discrimination proclaimed by Mussolini in Trieste represented the most brutal fracture in the history of the city, and allowed the squadristi (fascist squads) to attack and to raid the shops of Triestines of Jewish faith, as they had already done before for those of Slovenian or Croatian nationality. The Jewish community of Trieste, always faithful to Austria except for a few Italian irredentisti, had already suffered a high emigration rate after 1918. With the Italian fascist discriminations of 1938 started also the sad time of departures for those who could afford escaping abroad, and of increasing misery and fear for those who wanted or were forced to remain, only to be nearly all arrested, deported, and murdered by the Nazis upon denounce of Italian fascists. 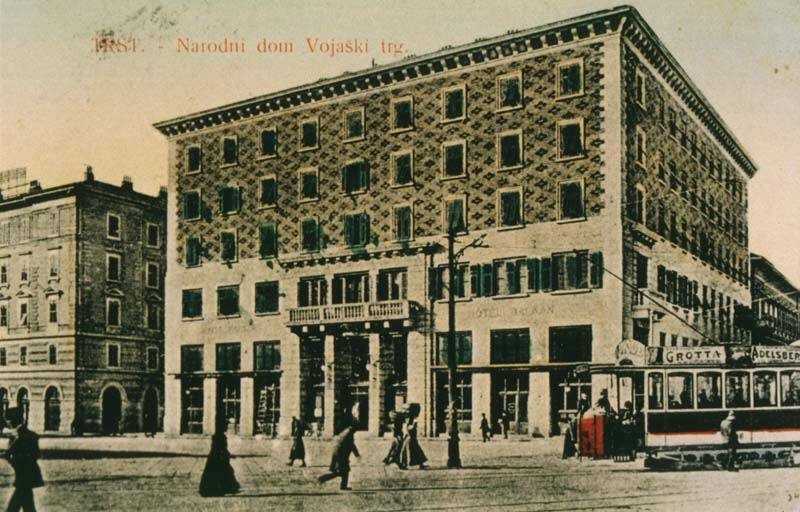 This tragedy changed the original face of the Trieste of Mitteleuropa, where from 1907 to 1931 the ancient and active Jewish community was present also in the piazza della Borsa with the balcony and first two floors of the Casa Verde and its elegant, popular, and crowded kosher Restaurant of the Hungarian-Triestine Goldbergers. 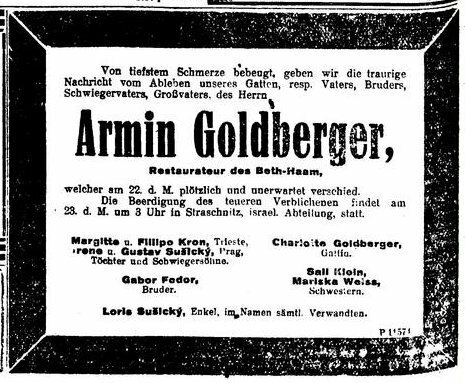 The head of the family, Armin Goldberger (LINK), was born in 1870 at Hőgyész, province of Tolna, he had graduated from the Jewish teacher’s seminary in Budapest and he spoke Hungarian, German, Yiddish and Hebrew. 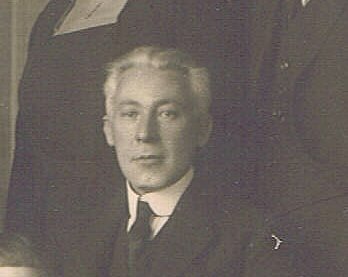 In 1892 he married Sarolta (Charlotte) Kohn, born in 1872 (LINK). 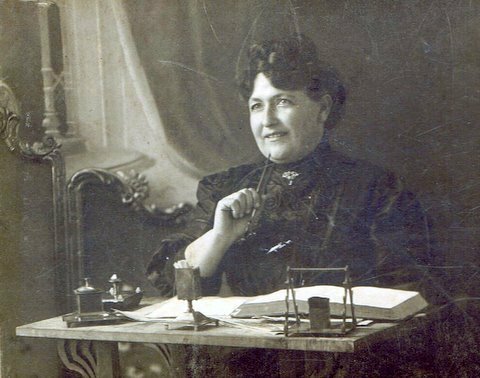 In 1893, after the birth of their first child, Géza, they moved to Graz, where Armin obtained a job as teacher, and where their two daughters were born: Margit Miriam (Margarita, Margherita) in 1894, and Irene in 1898. 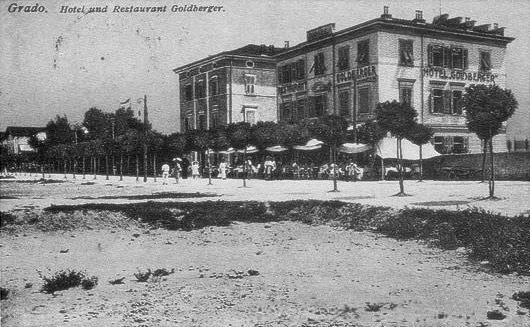 In 1907 Armin and Sarolta Goldberger moved with their children to Trieste, maritime capital of Austria-Hungary, where they did open the elegant kosher Restaurant Goldberger in piazza della Borsa (see head photo), and then the Pension Goldberger – Villa Riviera in Grado, popular seaside location of the Austrian Littoral (LINK). Soon, the restaurant became popular and crowded thanks to the quality and variety of Sarolta’s impressive Jewish cuisine. While Miriam studied to become a nurse and Irene studied piano and singing, in 1911 Géza graduated from the Trieste Staats-Real-Gymnasium and was hired at the Assicurazioni Generali. 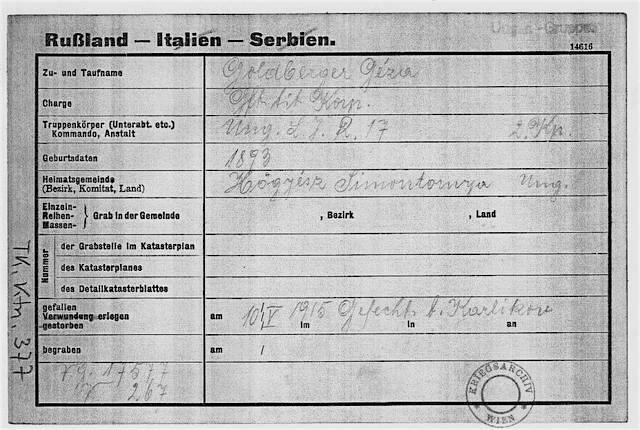 Since he spoke not only German and Italian (including Triestino) but also perfect Hungarian, the following year he was assigned to the Life Insurances Office of the central Generali office in Budapest, and at the same time he did also enroll at Graz University. 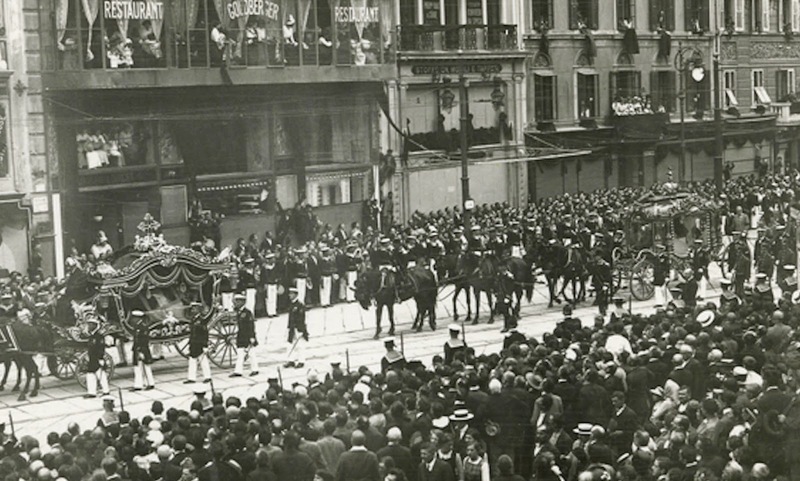 In 1914 the funeral cortège of the Heir to the Throne, Archduke Franz Ferdinand, and of his wife Countess Sophie, both assassinated by a terrorist in Sarajevo, did also pass under the balcony of the Restaurant Goldberger (LINK), surrounded by a moved crowd that could not imagine the consequences of what was about to come and overwhelm the civilization of Austria-Hungary and of Europe. When the war broke out, Armin and Géza were enrolled in the territorial army of the Kingdom of Hungary (Königlich Ungarische Landwehr – Magyar Királyi Honvédség) which was one of the three parts of the Austrian-Hungarian armed forces, where served over 300,000 Jewish soldiers, suffering 40,000 casualties (LINK; LINK). Margit served as a volunteer nurse in a military hospital. Armin was sent to Kadarkút in the Somogy province, while Géza (LINK) left for the Galizien-Front with the II Company of the Magyar Királyi 17. Honvéd gyalogezredet – Königliches ungarisches Landwehrinfanterie-Regiment Nummer 17, from Székesfehérvár. On May 10th, 1915, during the Gorlice-Tarnów Offensive, Géza Goldberger died a hero fighting near Karlików (LINK). The memorial published by his co-workers of the insurance office in Budapest calls him one of the heroes of the Generali: a Generali hőseí sorában (LINK). After the war, Margit (LINK) married Triestine businessman born in Vienna Filippo (Philipp) Pinchas Kron, former Austrian-Hungarian officer who distinguished himself in the battles on the Russian and Italian front, they had two daughters, Erica and Noemi. Irene (LINK) married entrepreneur Gustav Sušički from Prague, who was in the business of electrical and medical equipment; they had a son, Loris. 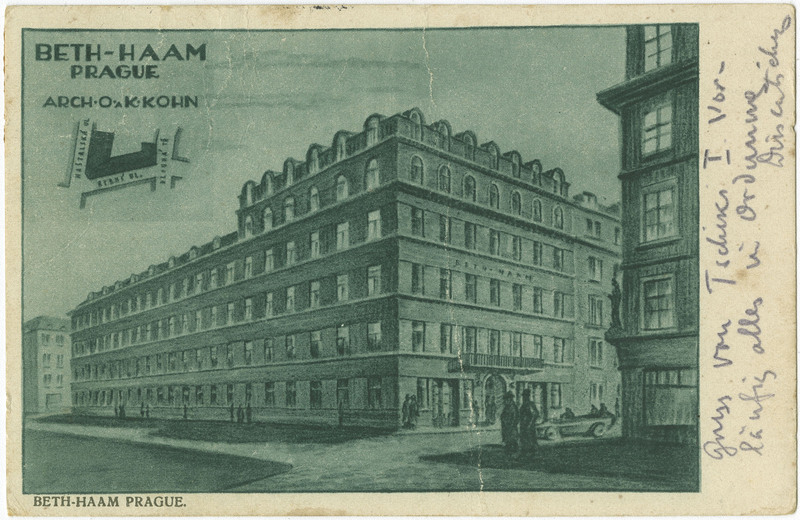 Armin and Sarolta continued to manage their pension in Grado and the Restaurant in piazza della Borsa (and the Fascists forced them to change the insignias to “Ristorante”: LINK) until the Thirties, when they moved to Prague to run the kosher restaurant of the Beth Ha’am (Židovský lidový dům – Jüdisches Volkshaus: LINK). Armin did not see the tragedies of the years to come, because he died in Prague in 1933 (LINK), and Sarolta returned to Trieste, where she lived with her daughter Margit and son in law Filippo Kron, taking care once again of the Pensione Goldberger in Villa Riviera, Grado, in summertime. From 1938 the work activities of the family became harder because of Italian racial laws, which discriminated Jews in civil life, in schools, in employment, and were accompanied by increasing economic vexations, threats, and outright violence. The Krons sent their young daughters Erica and Noemi in Palestine, however they remained in Trieste with Sarolta, who died there on October 11th, 1940. Two years later, in Nazi-occupied Czechoslovakia, Irene Goldberger, her husband Gustav and their son Loris were arrested and deported to the Terezin-Theresienstadt concentration camp, which they left in October 1944 to be sent to the Auschwitz extermination camp, where they were murdered. In September 1943, when the Nazis reached also Trieste, Margit and Filippo did succesfully escape in the Veneto, at Pieve di Soligo, where they found a temporary shelter escaping razzias until the end of the war. 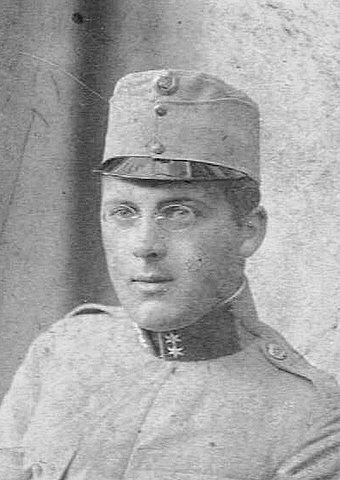 Filippo was arrested by chance as Italian hostage to be shot, but Margit persuaded the Germans to free him for his rank as former Austrian-Hungarian officer. The Krons could return to free Trieste in 1945, but Margit has become seriously ill and died on July 27th, 1946. In Trieste, Filippo married again to Erica Cilla, and after her death in 1960 he reached his daughters in Israel, where Noemi, married to engineer Rudolf David Larisch, lived in Tel Aviv, and Erica, married to Haim Zudkowitz, lived in Haifa, where Filippo died in 1967. The story of the Goldbergers, which winds through Budapest, Graz, Trieste, Prague, Tel Aviv and Haifa, deserves to be brought back to memory both as itself and as evidence of the identity and history of Trieste as a precious, peaceful, natural mosaic made of as many tiles as are the origins, languages, faiths, and cultures of its inhabitants. The mosaic of what at the time was the “Philadelphia of Europe” (LINK) born thanks to the Free Port, with the Synagogues of a Jewish Community that lives there since the III Century, with the churches of Catholic, Serb Orthodox, Greek Orthodox, Armenian, Evangelic Christians, and the Mosque for its loyal Bosniak soldiers. 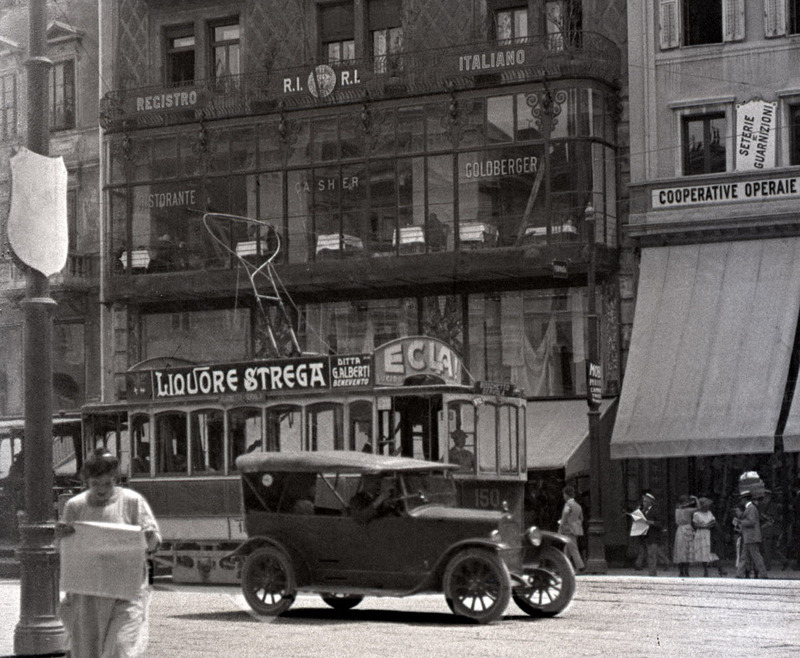 And it might be a sign of destiny that in 2018, where the Restaurant of the Goldbergers had once testified, in the heart of Trieste, the fruitful multicultural reality interrupted in 1918, now stays the head office of the Free Trieste Movement – Movimento Trieste Libera, which works to restore it.